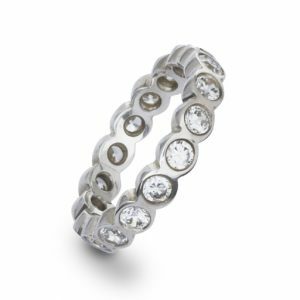 We specialise in unusual eternity rings that feature our characteristic robust metalwork so that the rings will last if not for an eternity, near as damn it! 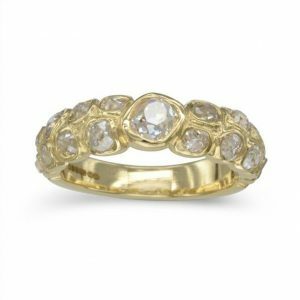 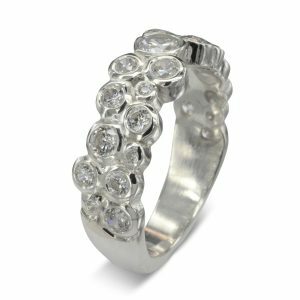 Eternity rings traditionally have stones set all the way around the band but we also make them with a 60% or 40% spread. 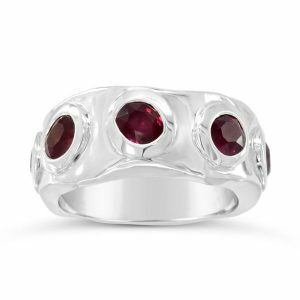 Both appear as a full spread of gemstones from the front. 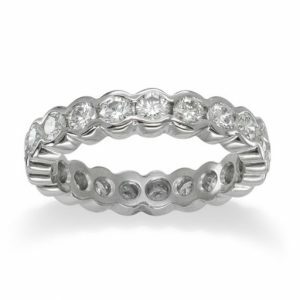 An eternity ring often has to be made to match your wedding and engagement ring set. 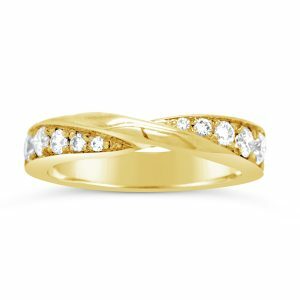 Our designers can suggest what will look best with your existing rings and also make sure that the new ring will not cause any damage or be damaged by your existing rings. 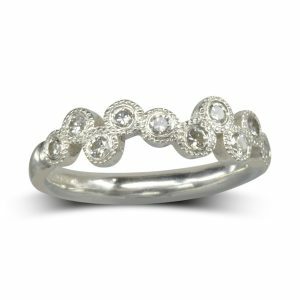 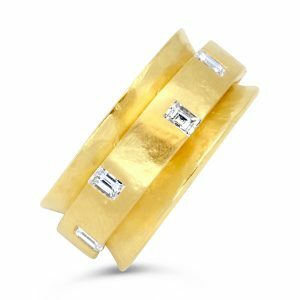 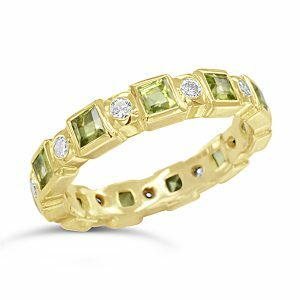 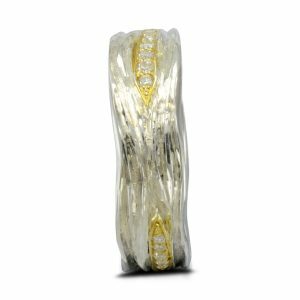 We use several setting styles for our eternity rings. 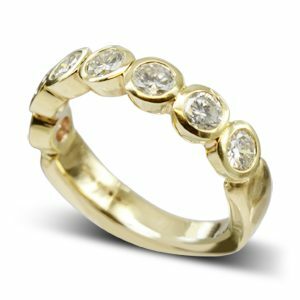 A rubover setting surrounds a stone emphasising it’s shape. 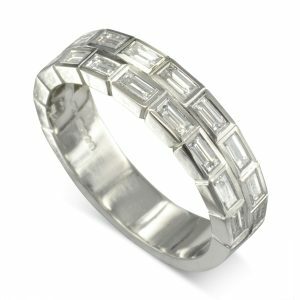 Our new collection utilises this effect by mixing different shapes such as an alternating princess cut diamond with a round brilliant cut. 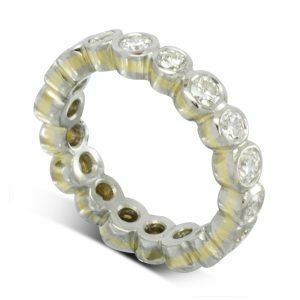 A claw set eternity ring creates an eternity ring that appears to be made of only diamonds or the gemstones that they are mixed with. 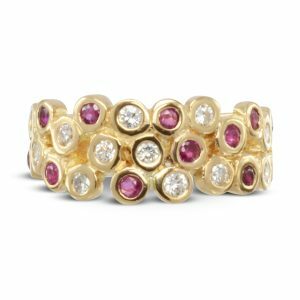 Aquamarine or pink sapphire make a subtle combination, where sapphire or ruby a more striking contrast. 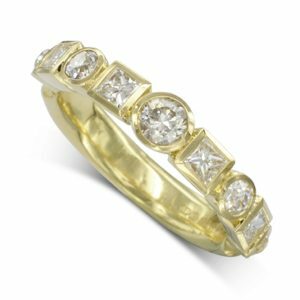 Channel setting creates a linear look to the diamonds with a metal edge emphasising this. 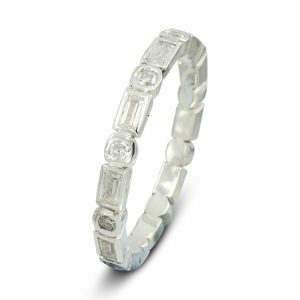 It is now popular to “flush set” diamonds into a band of your chaice. 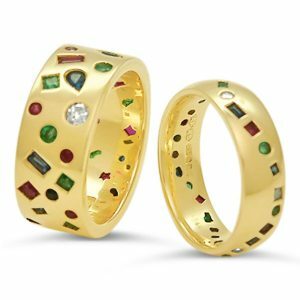 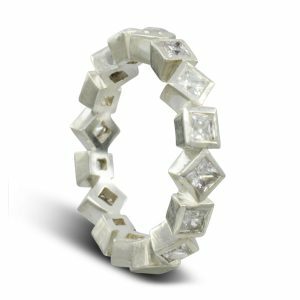 We do this in a number of designs from evenly spaced to scatter generously around the ring using up to one hundred gemstones. 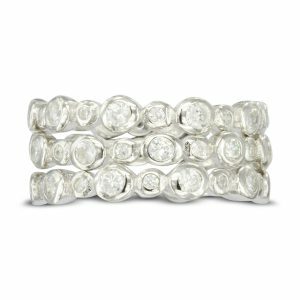 We also make an unusual eternity ring in our Nugget collection which looks quite different again. 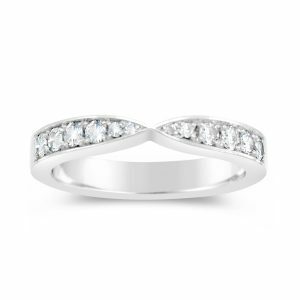 Eternity rings can be made in any precious metal. 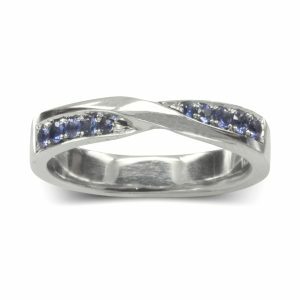 It is best if it made in the same metal as your existing rings but we recommend platinum as a default as it is the hardest and strongest of the precious metals. 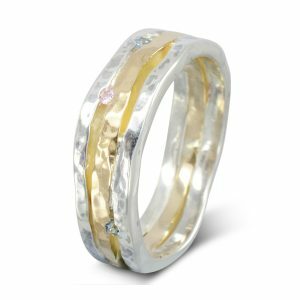 If you want colour then 18ct yellow gold or rose gold can look beautiful. 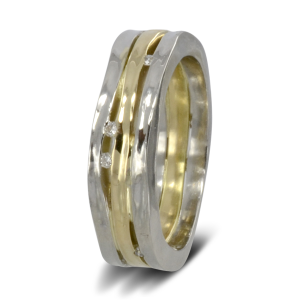 Browse our selection here or visit our Ditchling Gallery to try some on. 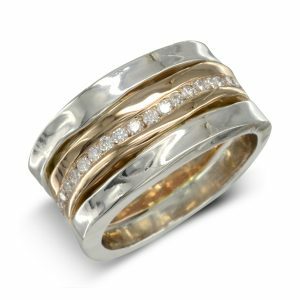 Our usual delivery time on eternity rings in four weeks.